My deepest apologies for not keeping up with yellow card questions, or posting in general. I'll not hold it against you if decide to banish me to Hainan. I had a kinda busy end of semester, but that by itself can't excuse or explain my negligence and and general absence from net space. The rumors are true. Or some of them are anyway. 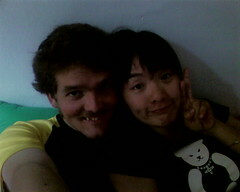 I have joined the stereotyped ranks of those foreign white men with Chinese girlfriends. In accordance with the declared Honey Picture Month, I am posting this picture at the 11th hour. In case you were wondering, my 'do' in this picture only lasted a few days. I may be a child of the 70s, but I don't belong there. How does it feel to finally fit a stereotype? And no kidding about the 11th hour, did you have to mess with the time stamp to make it in? And yay for Honey Picture Month that makes it a little less lonely in the blogosphere! Hey, cute picture!!! Now we want a picture of the new 'do! We are comforted to know you are still among the living...actually looking quite lively, as a matter of fact. And debonair, with your beard cut off and your mustache trimmed like a 1930's movie star. I guess love does that to a guy. Honey Picture Month has been a smashing success. We are now looking for a theme for July. How do you say "debonair" in Mandarin? Yeah, I faked the time stamp. I actually wrote this post after midnight. I cheated. The new 'do' is pretty boring, although it was actually done in a barbershop, i.e. the first and only one of its kind. 1930s movie star? hmmm. I figured it was very 1970s, but I don't remember either decade very well. Hey! I don't think there is anything remotely stereotypical about it. You're a guy, she's a gal. Natural doesn't mean stereotypical! I'm totally glad you took the plunge. But does this mean you're not coming back to SD? Honey Picture Month went very well, thank you, but now August is Pet Picture Month. Sometime before you leave China, you must claim a pet for long enough to take a picture (no animals may be harmed in the process) and post it. Bon aPETite.